In the series up to now I have been chasing the ideal portable camera. I’ve just got a new favorite which is so compact for its quality that it appears to break the laws of physics. 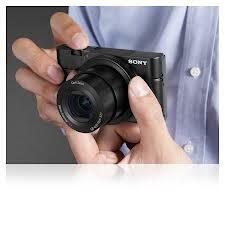 Meet the Sony RX-100…. Those of you who have read all the ‘cameras’ series will have gathered that for compact camera sensors, there is an inherent conflict between picture quality (the bigger the sensor, the better the picture quality), and lens size (the bigger the sensor, the bigger the lens and the overall camera dimensions). 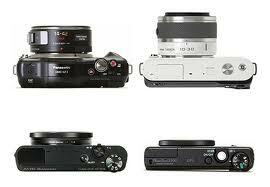 As a result, compact cameras with zoom lenses have always had small sensors. Cameras with big sensors can have bodies that are tiny, but they always need pretty huge zoom lenses by comparison. Since I want a camera that I can carry with me at all times, I have been focused on systems that extract the best quality from a small sensor. This has led me from the pixel array wizardry of Fuji EXR cameras to the tricked-up firmware of the Canon SX220 class. Now I have a new favorite. In part 6 of this series, I mentioned I was looking at the 4/3″ systems, specifically the Panasonic G3X. But on closer inspection, that camera with the kit zoom lens was almost the same size as my existing NEX-5, albeit with a smaller sensor. And there is the rub – larger sensors go with larger, non-pocketable lenses. What you might think is needed is a sensor a good deal bigger bigger than the Canon’s 1/2.7″, but small enough to enable a compact zoom lens (note, at the end of this post I have added an explanation of what the ” or “inch” metric actually means for sensor size). Last year Nikon came out with a new sensor size, in a new camera called the “1 Series”, which had a new 1″ sensor, that sat between those of the 4/3″ systems and the small compact minis. Sadly, they created a camera almost as big as the 4/3″ ones, but with half the sensor area – and with few manual controls. So back to the drawing board. It turned out that Sony made that sensor though, and Sony have great electronics skills and more importantly, superb miniaturization skills. And a month or so ago, Sony announced a new pocket gem – the RX-100, with a top quality zoom lens and a 1″ sensor packed into a tiny camera body. It is the most fun I have had with a camera for ages, and it has returned to me the pleasure of just taking pictures (looking, usually in vain, for the good ones). One of the things that drew me initially to the RX were almost universally good reviews – including this one from my favorite site, Photography blog, which calls it ” best pocket camera that avid photographers can currently buy” (currently being the watch-word – this status will last about 4 weeks). The New York Times called it the “best pocket camera ever made”, capable of ” insane amounts of detail and vivid, true colors”. I don’t know about insane, but it does take lovely photographs. I will show a few of my early ones in the next post, but in the remainder of this one, I want to highlight a few items about the camera that make me like it so much. The first thing is of course the overall size compared to sensor size. The RX-100 is in the bottom left of these four cameras. To it’s right is the Canon S100, which until last month was regarded as the best pocket camera, and which has a sensor only 30% of the size of the RX-100. Top left is the Panasonic GF3, with a sensor 2x the size of the RX-100, but with a shorter zoom (and it’s more expensive). And top right is the Nikon J1 with a sensor the same size as the Sony! That the Sony can cram a larger zoom in a camera half that depth, with the same sensor size, seems to defy the laws of optics.The way it is possible by the way, is by not having interchangeable lenses with a standard lens mount as the Nikon does. 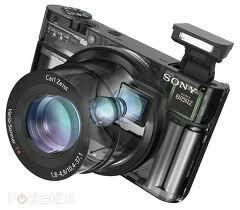 By that means they can move the lens right up to the sensor, and with trickery in the zoom construction, fit it all in. The RX-100 is a truly miraculous combination of size and specification. It fits in the same case as I use for the Canon SX220. That’s how small it is. The second thing I love about the Sony is the handling. The menu system has been imported from the DSLR range, and is simple, functional, and with every major function assignable to a button. This is enhanced by a clever control ring round the lens that allows fast selection or manual focusing. So it’s really easy to shoot in manual all the time, but one can change ISO or exposure in a trice. This is a vastly better system than the pretty cumbersome touch screen menus of the NEX-5, which are a pain to move around, and phenomenally simpler than the Nikon D7000, with it’s 13 buttons on the camera body. Next, the lens. It’s a Zeiss (sort of), but it’s firstly very fast when wide open, and secondly, very sharp. This lens is a real beauty, and superior in my view to my Sony NEX zoom, or any other compact one I have used recently. I’ll be looking at edge sharpness in more detail soon, but in my first shots it looks sharp right across the frame. The lens is a 28-100mm zoom (35mm equivalent) . That’s a wider range than the Sony 18-55 (27-82mm equivalent), but considerably less than the 28-392 equivalent of the Canon SX 220. When wide open the lens is a fast f1.8, which is great for indoors or low-light shots. It’s not so fast zoomed out, but still as good as the Canon or other compact zooms. It also contains a built in lens cap/shutter which makes it a much easier proposition than with Panasonic and others that have a separate cap you can lose. Behind the lens sits a very high resolution 20Mp sensor which seems to deliver pretty noise-free images up to ISO 1600 (the same as the NEX-5). I have not yet done comparisons, but most reviewers say the quality is up there with 4/3″ cameras. And shooting is very fast – with a burst speed of 10fps, and video at 1080px60fps! The build quality is also outstanding in this camera. It’s a metal bodied, beautifully made instrument, like Sony used to produce. In fact it’s made in Japan, which these days is an expensive approach, reserved for only the best precision equipment. It feels nice and solid in the hand, and is also nicely balanced. That, plus the technology does make it expensive. It lists in the UK at around £550, or $650 in US. That’s a great deal to pay for any camera,and would get you an entry DSLR for the same money. But it’s the only game in town for a this combination of quality and size, so when I saw one on eBay for £425, I ponced, and have been completely happy with the purchase. Of course the camera is not perfect. The short zoom is going to be interesting to live with, and as a result I will not be retiring the Canon SX200 any time soon. Although the Sony JPG files are excellent, RAW files even in the latest version of Lightroom that supports them (RC4.2) look a little washed out by comparison. But so far, that’s really all I can whinge about. Finally of course, what really matters is what you can do with the camera. Possibly because it has re-enthused me somewhat, I am taking more photographs, and because of the shorter zoom, in a slightly different style, of which, more in the next post. Final note: what’s with the inches metric for sensor sizes? The standard frame size that everyone knows is 35mm, which results in a sensor that is usually 36mm x 24mm in ‘full-frame’ DSLRs. So why are most other camera sensors measured in inches? I think the reason is that while the first popular 35mm cameras, like the Leica were European in design, the subsequent development of digital sensors was led by Kodak, and focused on the US market (even by Japanese manufacturers), and US customers like inches. The way you get to the “sensor inches” metric, is by taking the diagonal measurement of the sensor, and multiplying by around 1.5. In fact the dimensions of the 1″ sensor are 13mm x 9mm, yielding a diagonal of 16mm, which is just under 1″ when multiplied by 1.5. So there you have it.